NowComment handles 99.99% of web HTML and Microsoft Word files without problems of any kind. 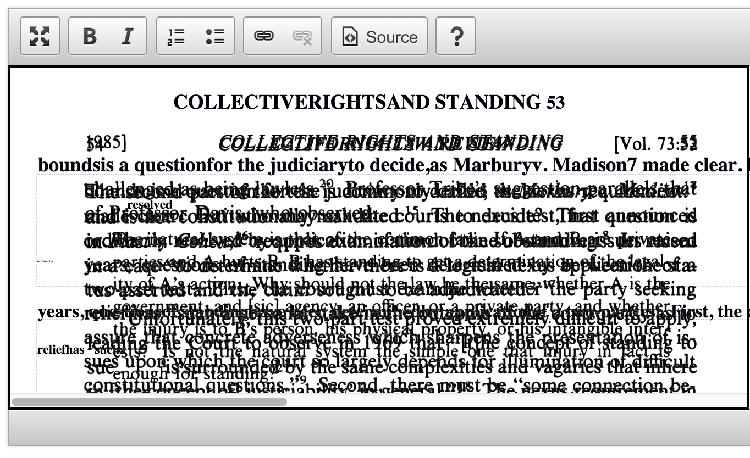 PDFs require a bit of explanation. NowComment offers a 3rd-party converter at no charge that works on editable PDFs (PDFs that you can highlight part of the document without highlighting the whole document). Be sure to specify if your PDF was created through scanning (OCR); processing an OCRed PDF through the Standard Convert won&apos;t be usable. Extra spaces between letters of words in a NowComment document is caused by a corrupted PDF. For unknown reasons, printing an MS Word document to PDF and then processing it with our PDF converter doesn&apos;t work well. Abbyy FineReader is an OCR converter that&apos;s integrated with NowComment; it&apos;s an extremely easy and time-efficient way to convert PDFs, images, and other file types (English language only). If you might want to OCR in volume (1000+ pages) within NowComment for just a few cents per page please email us for information. Abbyy FineReader Online gives you 10 initial PDF page conversions and 5 additional free pages each month. In 2015 it could recognize almost 200 languages! Abbyy FineReader Desktop offers free trial versions (Mac or PC) that give you 100 free page conversions (and have more features than the online version). Desktop Applications — we haven&apos;t had an opportunity to try BCL EasyConverter Desktop yet. Applications we looked at a year or more ago include Acrobat Pro (surprisingly unreliable in our experience), Google Docs (10 page limit), Nitro PDF Professional (not very good with images), Nuance PDF Converter (pretty good with editable PDFs), and Nuance OmniPage (comparable to Abbyy but more expensive). Online converters — These vary in capability. Many are low-end PDF converters that just turn a PDF into a .jpg or .png image (which can be uploaded to NowComment, either as a standalone document or appended to an existing document, but you won&apos;t be able to comment on specific Sentences or Paragraphs like a regular NowComment document). Convert Files handles most documents pretty well, though we found not quite as accurate as BCL or the OCR options above. Problems with the Text of Your PDF? If the text of your PDF shows in NowComment as random weird characters, or all question marks, or all periods, that means your original PDF is improperly formatted (not caused by NowComment, which copies your PDF but doesn&apos;t change it in any way). A PDF can have a formatting problem even if it shows up fine in a PDF reader. You can test this by selecting a section of text from your PDF and copy-and-pasting it into a text editor or MS Word; if the PDF is normal the text characters will all appear unchanged (though bolding and italics may be lost), but if the PDF is improperly formatted the copied text characters will be unrecognizable. Uploading images to be commented on as images is very straightforward, just consider reformatting .tiff images to another format as noted in our upload documentation. If you want to do OCR on an image, see the OCR discussion in the PDF section above. If you&apos;re document is poetry or other non-grammatical text with carriage returns (paragraph marks) at the end of every line, use Word&apos;s find-and-replace feature to replace most of the carriage returns with line break characters (keep the carriage return wherever you do want a blank line, e.g. between stanzas of a poem). More information here. Sometimes pictures and images don&apos;t display well with paragraph text wrapped around them; when this is a problem just move the image before or after the paragraph and separate them with a carriage return. Word doesn&apos;t handle embedded videos (but in NowComment you can always append a video to an already-uploaded document… or append other documents to your video!). If a Word document has some glitch and doesn&apos;t upload to NowComment do a “Save As” from Word to create a new document (try a different format, e.g. .doc if you had a .docx) and then try uploading the new file to NowComment. Unlike images and text, copy-and-pasting media players (e.g. YouTube, SoundCloud) from a web page won&apos;t work; you have to copy-and-paste the media player&apos;s “embed code” (often obtaining by clicking a “share” or “sharing” text link). See our upload documentation for more information. Don&apos;t use old versions of Firefox (one of our favorite browsers!) to upload documents; rich text formatting (bold, italics, superscripts, color, etc.) will be lost. This isn&apos;t a NowComment limitation; see Google&apos;s suggestions and this MozillaZine article. You can copy only the part(s) of a web page (or parts of multiple web pages) that you want discussed; feel free to delete extraneous text, advertisements, links to unrelated documents, site navigation buttons, etc. Use our “Text I&apos;ll Write Now” upload button. You can either type something new into the text entry box or copy-and-paste plain text from an existing plaintext document (or screen message or email or…). convert to PDF: see this MS Office tip (for PowerPoint 2013 and 2016) or try using Google Slides. One format that may be challenging is LaTex, but perhaps there are better solutions we don&apos;t know about.